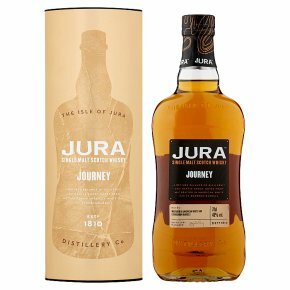 Jura Journey It's the journey, not the destination that shapes us. The path from our foundation to the rebirth of our distillery in 1963 has shaped character of our community and the whisky we produce. This road has led us to our own unique style. Matured in a American white oak ex-bourbon barrels for a sweet finish. A refined balance of rich fruit and gentle smoky notes. Amber gold in colour with aromas of vanilla spice, citrus and a hint of sea spray, followed by cinnamon, pears, pecans and toffee fudge in the aftertaste.